“Omega-3s are essential fats which the body cannot manufacture,” explains Louise Sinnah Burr, a nutritionist and ambassador for Bio-Synergy (www.bio-synergy.co.uk). “They are derived from foods such as fish (especially oily ones such as salmon, mackerel and sardines), vegetable oils, nuts (particularly walnuts) and flaxseeds, including cold-pressed flaxseed oil. Not only are omega-3s integral to cell membrane structure, they also play a key role in hormone regulation, blood clotting, artery wall contraction and dilation, and managing inflammation. Hence they provide a number of health benefits associated with heart health, blood pressure and joint inflammation diseases. Research also shows that omega-3s are linked to metabolism control – promoting fat-burning –and healthy brain function.” Louise recommends taking an omega-3 fish oil supplement two to three times a day with meals, particularly a product where the ratio of omega-3, 6, 9 is about 3:2:1. “Protein is the body’s first choice when it comes to a fuel source, with carbohydrates second and then lastly fats,” says Chris Hall, founder of Hall Training Systems (www.personaltraineroxford.com). “Unlike carbohydrates and fats our bodies are unable to store protein and so we have this constant breakdown and uptake of amino acids (protein). If our intake of protein is insufficient then our bodies will look for alternative ways to increase its amino acid pool, and it does so through the breakdown of muscle tissue. To the everyday person this isn’t too detrimental, although far from ideal. To a sporty person this can be detrimental to both performance and health. “Glucosamine is an amino sugar which is one of the major components of cartilage within the body,” explains sports and exercise dietitian Noor Al Refae RD PgCERT. 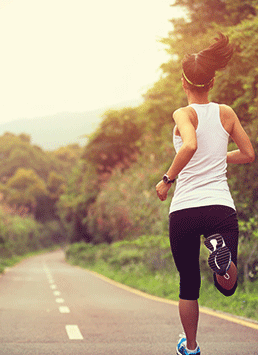 “Sports and exercise can place high impact on our joints cartilage, leading to wear and tear. Typically glucosamine is known for its role in osteoarthritis, but has now become of more interest within the fields of sports and exercise. Some studies have shown that supplementing with glucosamine prevented cartilage breakdown and improved knee flexion and extension following sports injury. Pain and inflammation was also noted to be reduced following supplementation.